Headless monks, disappearing scientists, demon barbers, and clever killers abound when Sherlock Holmes is on the case! 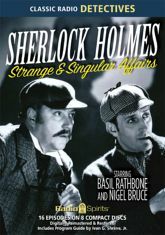 Basil Rathbone and Nigel Bruce are the World's Greatest Detective and his doughty sidekick in this collection of sixteen classic episodes! Journey back to those foggy days in London Town when, at the slightest provocation, "the game's afoot!" Let yourself be led by the legendary pipe smoking, cap wearing genius who solves the mystery, saves the day, and even seems to come back from the dead!